Buy Meyer Lemons- Order Meyer Lemons Online...Juicy! Meyer Lemons...the Meyer Lemon is believed to be a "cross" between a regular lemon and a mandarin. These lemons tend to have a more smooth and "rounder" texture than your average lemon variety. Meyer Lemons were discovered in China, brought to America and seemingly ever since, Chefs and great cooks everywhere have rejoiced! With their sweeter, less tart and abundant juice content, it is no wonder even the Famous of the Famous T.V. 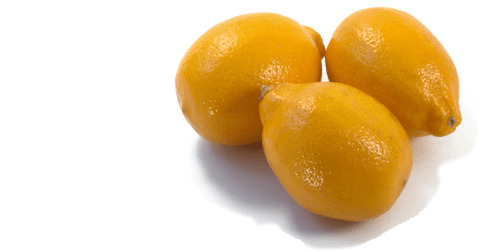 Chefs and Cooks sing high praises for the Meyer Lemon. In fact, there is especially one T.V. personality who always reminds us that with the Meyer Lemon's distinctive and flowery flavor..."it really is a good thing". Or as we say here at Pearson Ranch like to say; "When life hands you lemons, make something fabulous!" Did you know...? The Meyer Lemon gets it name from a USDA employee (Frank N. Meyer) who brought back a sample to the U.S. from a trip to China in 1908.